Mix the zest of 2 of the oranges, the peel, sultanas, Grand Marnier and brandy. Cover and macerate overnight. Preheat the oven to 180°C, gas mark 4. Butter a 2-litre pie dish. Spread the bread with the butter. If the slices are large, halve them. Line the dish with overlapping bread slices and scatter over half the peel and sultanas with some of their liquid. Cover with another layer of bread. 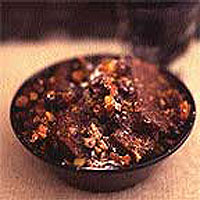 Scatter with the remaining dried fruit and liquid. Put the milk, cream and remaining orange zest into a pan. Bring to the boil, remove from the heat and whisk in the chocolate until it has melted. Whisk the eggs, egg yolks and sugar until pale and frothy. Slowly stir in the chocolate milk. Pour the mixture over the bread, lifting the slices slightly so it soaks through. Leave it to soften for 15 minutes. Bake in the centre of the oven for 40 minutes or until the custard has just set. Dust with icing sugar. Serve warm or cold with cream.